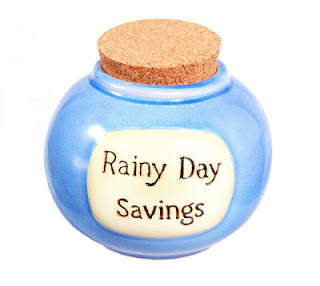 Even if your financial situation is looking rosy, it never hurts to start saving for the proverbial rainy day (or, if you’re unlucky, days). Getting a savings account and getting into the habit of putting something in there each month is never a bad thing, and could save your bacon in a time of unexpected financial stress. But what are the best ways to ensure that your savings account doesn’t go neglected? Here are a few humble suggestions. This a great way to ensure that you put something aside each month. If you have a direct debit set to come out of your main account and into your savings shortly after pay day, you won’t be able to forget or make any other excuses not to do so. Don’t knock it till you’ve tried it; all those pennies really add up. Regularly dropping your small change into a container of some description not only stops it weighing you down (or, if you’re anything like my housemate, strewing it all over the bottom of your bag or bedroom floor) but also gives you a nice surprise when you finally get around to counting it. Sort it out and take it to your bank in special bags and you can pay it straight into your account. An old finance mantra says that you should always pay yourself (your savings) first. While this is certainly a good idea, you can always turn this piece of advice on its head and get it to work for you just as well. Paying yourself first means that you usually need to specify a particular amount, and while this works for some people others find it more productive - and rewarding - to save for the duration of the month before paying what money they have left into their savings account at the end of it. Perhaps more of a general finance tip than one specific to savings as a whole, but an important one nonetheless. To be fair, outgoings can certainly have an impact on your savings; if you spend too much or suddenly have to make a big purchase (for example if your washing machine breaks down and you have to replace it) then you might be inclined to put less money into your savings account that month. There’s no need to limit yourself too harshly, but definitely be aware of where your money is going.